MCLEAN, Va. — Former Virginia Gov. 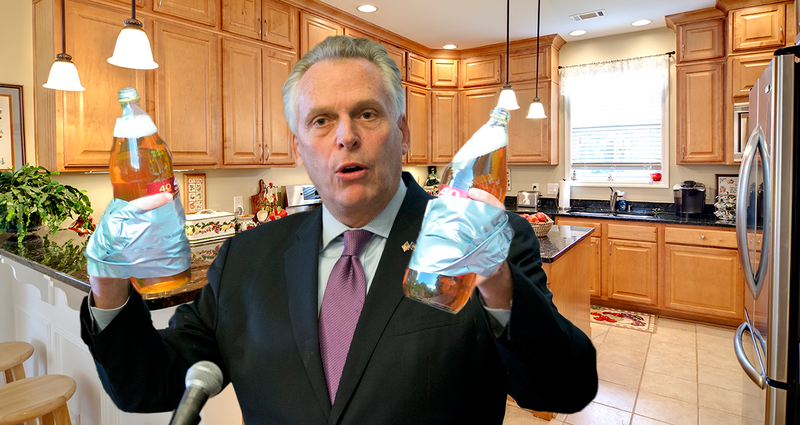 Terry McAuliffe announced his intention to run for president today from the comfort of his home in McLean, reportedly while playing the popular binge drinking game Edward Fortyhands. The game, which requires the player to duct tape a 40-ounce bottle of malt liquor to each hand and drink until both are empty, has reportedly been in the works for months and is seen as the surest sign yet that McAuliffe is serious about his campaign to unseat President Donald Trump. McAuliffe joins Sen. Elizabeth Warren, D-Mass., and Sen. Kamala Harris, D-Ca., along with many others from the Democratic party, in considering a 2020 presidential run. However, in accordance with rules of the official presidential primary drinking game, McAuliffe’s campaign could not officially begin until he had finished his entire 40-ounce bottle of Olde English 800. According to sources, the morning began with McAuliffe inviting a pool of reporters into his living room and apologizing for only taping one forty to his left hand. “I hate to break with tradition,” McAuliffe stated, “but I’m going to have to keep one hand free to work the microphone. You look like a lovely audience.” McAuliffe then proceeded to monologue his thoughts on the Richmond food scene while his wife Dorothy rolled her eyes from the kitchen. Initially, several reporters who were not familiar with the former governor’s antics were confused as to why they were being asked to watch a 60-something-year-old man binge drink malt liquor at 7:00 a.m. and talk about evenings spent at Bandito’s. However, when McAuliffe launched into a stump speech about beer making America great, veteran Richmond Times-Dispatch reporter Dan Smith knew that history was about to be made. While this long-shot approach, dubbed the “drunk uncle” strategy, hasn’t been successful since fellow Virginian Zachary Taylor drank his way to the White House in 1848, McAuliffe has reportedly secured endorsements from the National Brewers Association, the Boston Celtics, the entire fan base of the Philadelphia Eagles, and every frat bro in Richmond. Show your support for local journalism – check out our online store.